Which TurboTax software is best for multiple users? So which TurboTax software is best for multiple users? To answer that question, first decide whether the software is for individual or professional use. 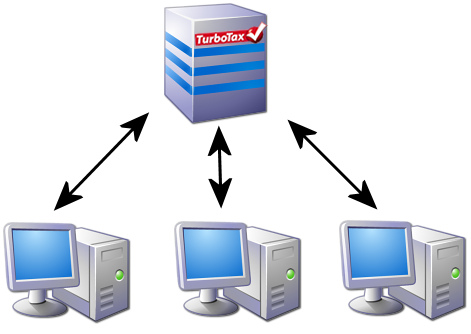 A single TurboTax product lets you e-file several returns but it depends on what version you use. You can either use TurboTax Online or CD/Download version. With TurboTax Online you can e-file one federal return and up to five state returns using the same user name and password. For every e-mail address, you can file five federal returns as long as you use a unique Taxpayer Identification Number (TIN) as well as user ID and password. CD/Download version allows you to e-file up to five federal tax returns and up to three state returns per each federal return. Using this version, you can prepare returns for as many states as you need but any additional return has to be printed and mailed. TurboTax offers three professional product lines: Lacerte, ProSeries, and Intuit Tax Online. Lacerte is tailored to streamline individual or business tax preparation regardless of the level of difficulty of each return. It supports well over 100 different tax forms and schedules and includes many tools to eliminate mistakes. For smaller number of returns, there is Pay-as-you-Go option; for busier activity choose Unlimited package. 50 1040 returns plus 50 individual state returns across 2 states. Unlimited number of 1040 and individual state returns across 4 states. Unlimited number of 1040 and individual state returns across 4 states plus up to 15 business returns (federal and state). Pay per return – best option if you file less than 30 federal and state returns; includes individual, business, estate, or gift tax returns. 1040 Complete – unlimited federal and state returns for all states; flexible pay-as-you-go pricing; supports federal and state business tax returns, estate and gift tax returns. Intuit Tax Online – web-based solution for tax professionals where you can select bundles of individual or business returns based on your needs. Individual tax return bundles come in 1, 20, 50, or 100 units; business returns come in 1, 10, or 20 units.